It’s been a stressful couple of weeks. I’ve been unwell for some time with a seemingly untreatable eye infection which makes doing anything vision-oriented (which is everything) difficult. To top it off, our cat got attacked by a feral cat a week ago and has been recovering from multiple wounds and abscesses since then. She’s finally pulling through, and I feel like my eyes might be improving too, so we all had a lovely peaceful time last night and finally got the sleep we needed. I’m celebrating these small victories and unwinding from the stress by taking it easy today: pottering around the house, rearranging knick-knacks and paintings in the house, mindfully tidying. 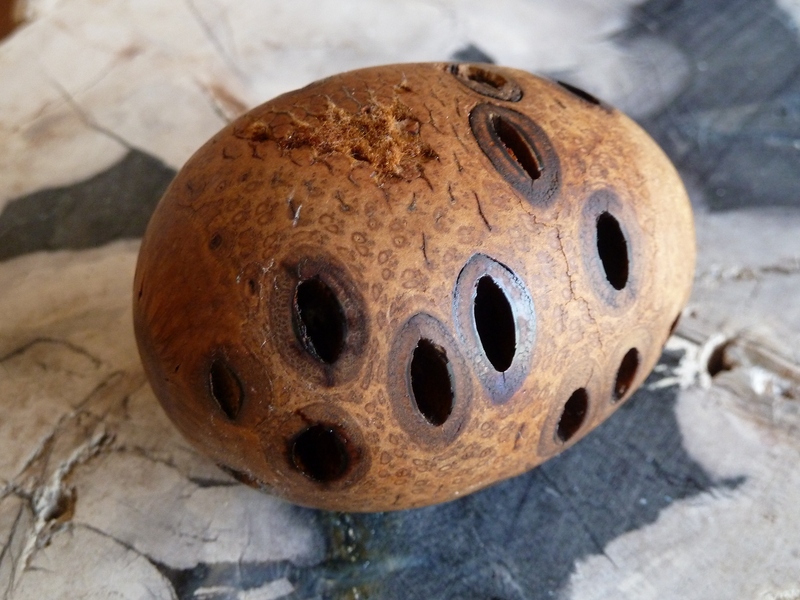 In the process I was reminded of this lovely hand-turned banksia seed pod “egg”, given to me by a dear friend last summer when she was staying with us. As a follower of my blog and someone interested in all things sensorial herself, she knew that this wonderful little smell-diffusing object would appeal to me. Spring is here. The days are getting longer and the temperature is warming up. Baby magpies cry out to be fed from nests in the tall gum trees. 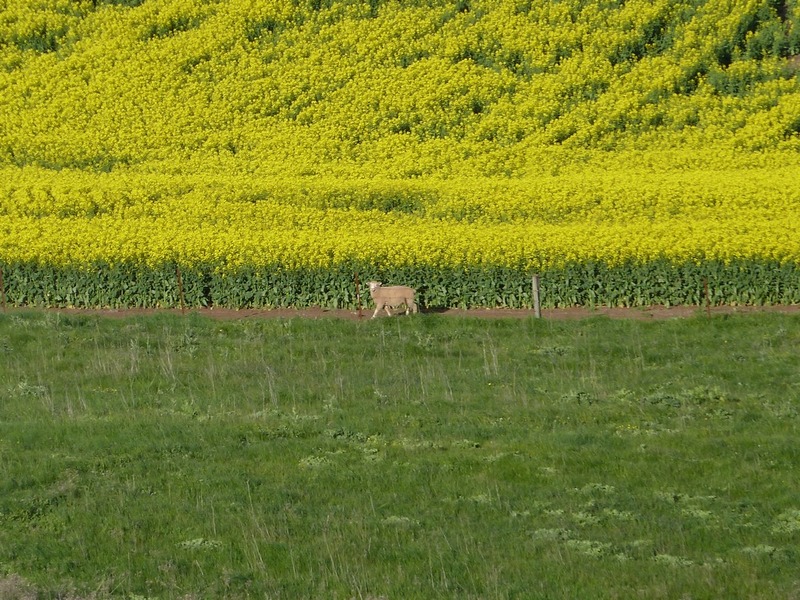 Their parents swoop me and screech threatening battle songs as I walk across the paddocks of canola. 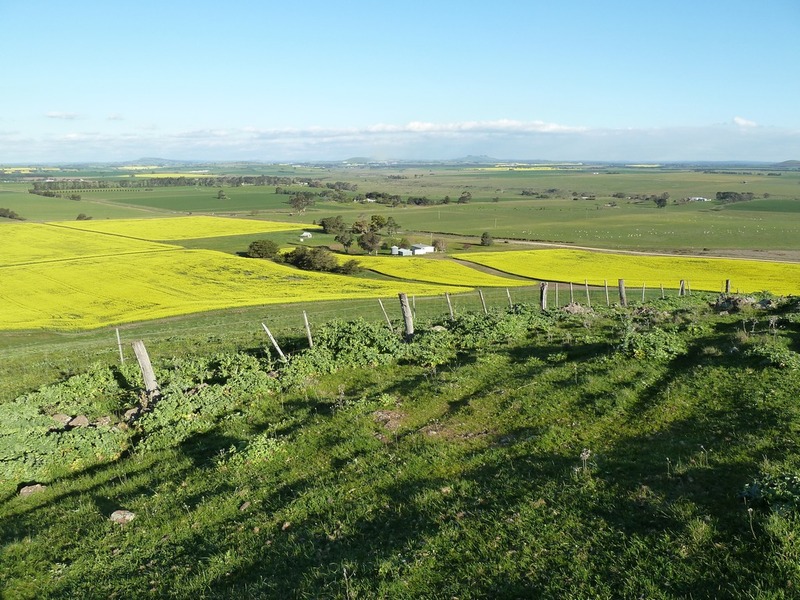 We’ve been watching the canola crop grow for months now; in the last few weeks it’s shot up to almost chest height, and each plant is covered in dozens of tiny, yellow flowers. The bright, almost fluorescent yellow of the flowers is incredibly uplifting. Hundreds of acres of canola flowers surround our house, yet today was the first day I smelt their scent wafting on the breeze. There must be literally millions, if not billions of the tiny flowers, but their combined scent is surprisingly subtle, until you smell the flowers up close. The scent of canola shares similarities with other yellow flowers: I think of the bright, rich scent of yellow daffodils when I inhale. There is a faintly urinous note and something deeper, more animalic and fleshy almost. 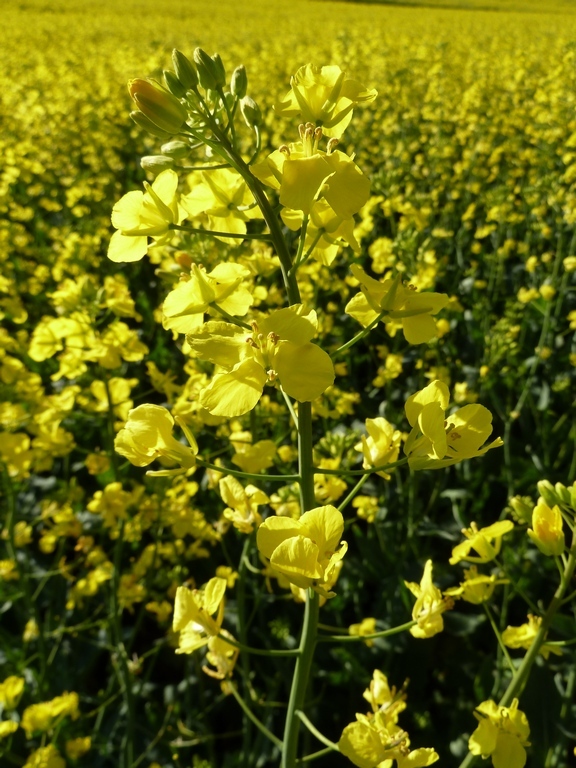 Overall however, canola is a sweet, bright and semi-powdery smell, slightly reminiscent of wattle, but much more gutsy. It’s narcotic, syrupy, rounded, rich and sharp all at once. As far as I’m aware, canola is not used in perfumery, which is a shame. This magical ingredient would work beautifully in a vintage-style floral-oriental fragrance. Yesterday Olly Technic, my partner in crime, made bread. It’s a recent obsession of his. Olly’s always been a mad connoisseur of bread, beer, and all things yeasted, but recently has immersed himself in the art of making bread, thanks to the discovery of James Morton’s book Brilliant Bread in a local remainder book shop a couple of weeks ago. 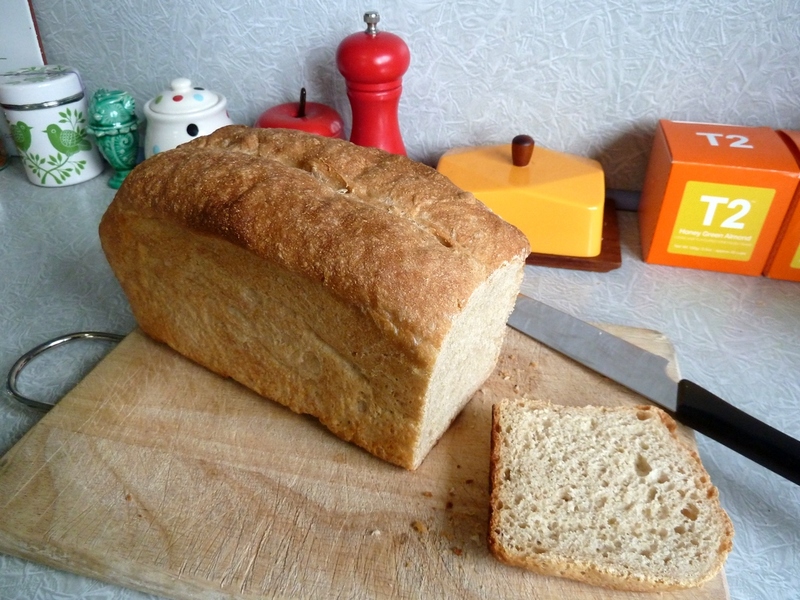 So yesterday, with Olly making a wholemeal wheat loaf, the house smelt of bread for four hours. First, the measuring and mixing stage, during which the scent of dusty, grainy wheat flour predominates. The yeast and salt are dry until the water is added, and don’t really permeate the air as smells yet. Once the water is added and the yeast is left to do its microbial thing, the smells of salt and yeast fill the kitchen, fungal and wet, slightly funky, a bit cheesy. Through the various stages of rising and shaping the smell of yeast gets wetter and stronger. Finally, the baking of the bread, and a smell so good, so toasty, warm, a tad salty and reeking of nourishment, that I want to devour the whole loaf. The old almond trees are now in full bloom. 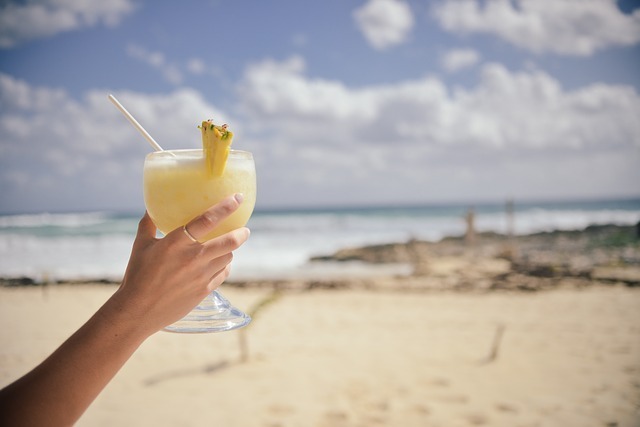 The weather oscillates between winter and spring: sun, rain and wind alternate rapidly. 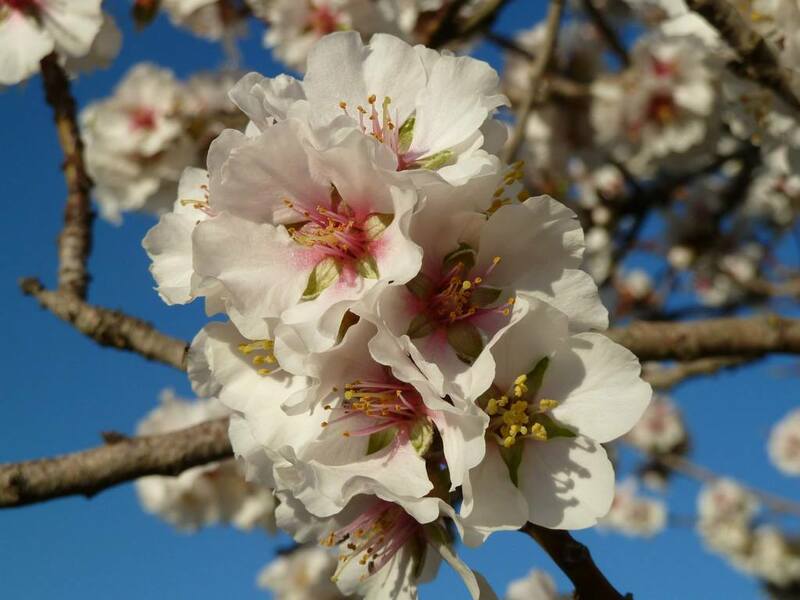 The almond blossom covers the tree in little white balls and an intoxicating, buttery, honey-like vapour radiates out for metres around. Hundreds of bees visit the blossoms, happily drunk on the sweet nectar. Their buzzing vibrates my eardrums. I want to lie on the grass and look up at the blue skies through the trees, but it’s still too cold. Already the wind and rain are blowing the blossoms off the tree. It snows blossom petals and they will soon be gone, but spring will soon be here. It’s late winter, and this year it’s been the kind of long, cold winter that I hope will end soon. Today I went for a walk in the cold, rugged up so much that I could barely move in multiple layers and my knee-length down coat. With wind chill the temperature was a brisk 2º celsius. I know that some parts of the world get much colder, but for a girl raised in sunny South Australia, 2 degrees is a shock to the system. The walk was challenging and cold, yet uplifting and energising. To reward myself at the end of it, I grabbed the secateurs and cut myself three stems of newly opened blossom from the old peach tree. Blossom is so beautiful – leafless stems dotted with clumps of flowers, both in bloom and still in bud – it creates a kind of instant, effortless Ikebana in the vase. 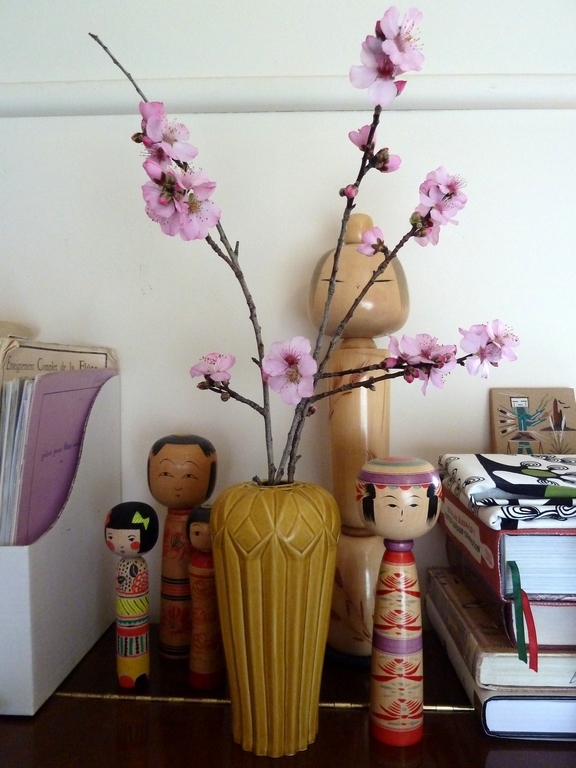 I couldn’t resist placing them on top of my piano with my Japanese kokeshi dolls. Blossom reminds me of Japan, of the Hanami cherry blossom festivals held there in spring, and of Ukiyo-e woodblock prints. 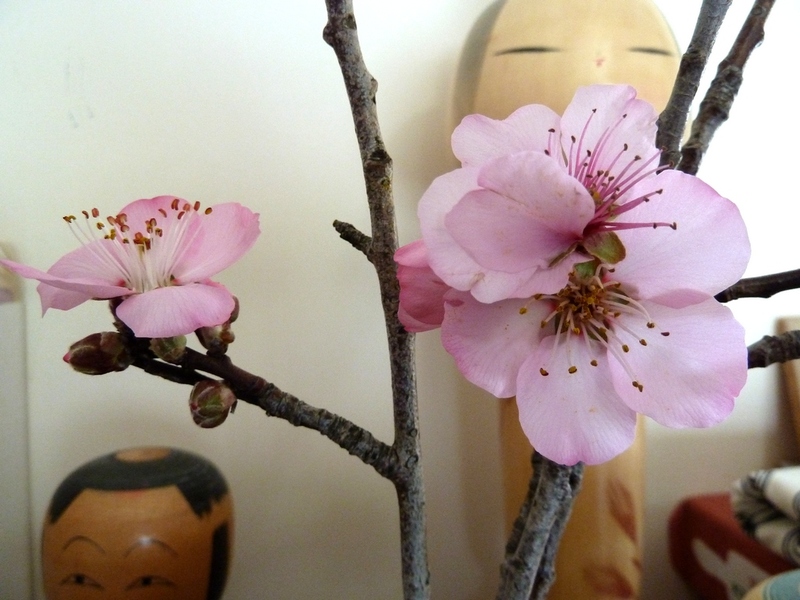 Peach blossom smells like honey. It’s sweet, almost in a sickly way. The smell is strong and as I sniff the blossom deeply my nose intuitively pulls back, feeling drunk with the pleasure of this overwhelming and narcotic scent, and perhaps anticipating a sneeze. The smell reminds me of sugar syrup bubbling on the stove, waiting to be made into tooth-breaking toffee. If I sniff a little less deeply, I detect a scent a little like that of sweet hay, grassy and dry. Peach blossom reminds me that the bees will soon arrive and harvest the precious, deliriously sweet pollen from this very tree. It makes me happy and reminds me that winter will soon be over. 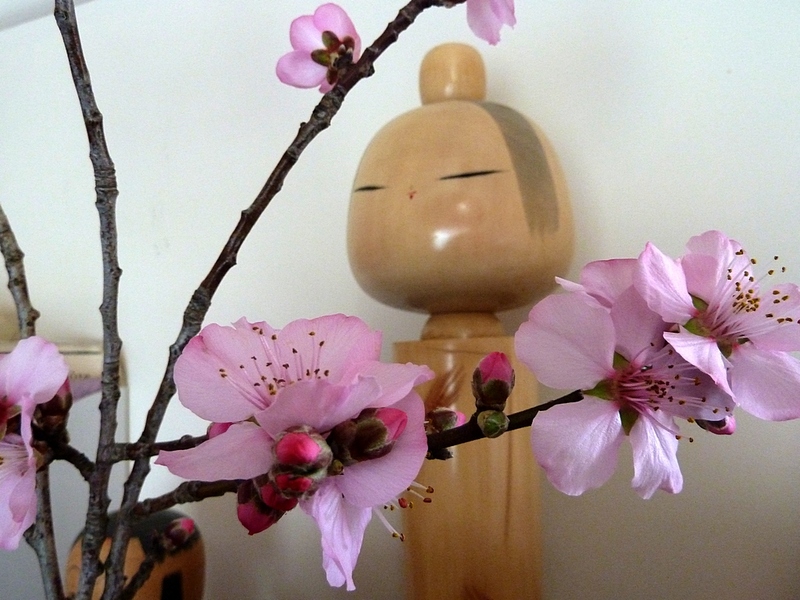 Peach blossom is the promise of spring in a vase.